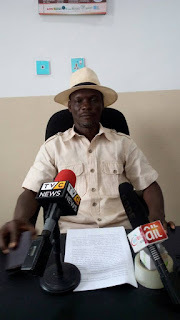 Delta State House of Assembly hopeful from Warri South-West Constituency in the 2019 general election under the platform of the Peoples Democratic Party, PDP, Comrade Sheriff Mulade has revealed that lack of quality representation, leadership development causes tension and series of violence in the Niger Delta region. Comrade Mulade made the declaration known Monday July 1 during a press conference to formally declare and gave update on his consultations visits so far and on his intention to contest the Warri South-West House of Assembly seat to represent people of the area at the Delta State House Of Assembly. He pointed out that leadership development and poverty has been the bane militating against peace, security and development in the region, adding that as an aspirant from Warri South-West which had been affected immensely, if given the PDP ticket, he will battle poverty eradication and other economic challenges in the area. The Warri South-West Delta State House of Assembly aspirant, Comrade Mulade, unveiled his 5 point agenda for Warri South-West Constituency, which include: Peaceful Coexistence in Warri South West Council Area, assuring that he will pursue a programme devoid of ethnic bias and that the goal of his programme will be to serve the Ijaw and Itsekiri Nationalities in the Council Area in a most virile way and work towards ensuring that peace prevail in all communities., embark on Poverty eradication programme, carryout empowerment through development of educational Facilities, sports development in the local government area and pursue environmental justice for all people of Warri South-West in order to enjoy fresh air. He noted that during consultation him and his team have visited The Olu of Warri, Ogiame Ikenwoli, The Pere of Gbaramatu, Oboro Gbaraun 2, The Pere of Ogbe-Ijoh Warri Kingdom, Pere Ama-Okosu Oromoni, The Pere of Isaba and the Pere of Diebri Kingdoms to seek for their royal blessings in order to succeed. He disclosed that his team have cited constituency offices in Ogbe-Ijoh, Oporoza, Ugborodo, Orere area in order to engage the grassroot effectively on getting first hand information about their needs. The Warri South-West House of Assembly hopeful says he is independent candidate to serve all and not imposed candidate, appealing to other aspirants not to get involve into character degrading of others, he lauded the Delta state PDP chairman, Olorogun Kingsley Esiso, for assuring free, fair primaries of all PDP aspirants in the state, while he paid courtesy visit to the chairman Sunday July 1, at Sapele to notify him officially about his intention to contest the Warri South-West Constituency seat at the forthcoming 2019 general election.